At the beginning of this month, I shared that I was working on changing some of my eating habits (namely kicking the sugar!) and decided to give Trim Healthy Mama a try.In the first few days I lost two pounds (and I wasn't even fully on plan!) and the following week dropped another three (still not completely on plan). Believe me, this is a big deal! I've been exercising faithfully for a year now with some great inch loss but hardly any weight loss. This week I'm working on sticking to the guidelines completely because I want that scale to keep moving down! It might not be the best time to try this since we're going camping this weekend and then we'll be visiting family in various parts of the US! One of the big selling points for me with this way of eating was that I wouldn't have to completely give up chocolate! 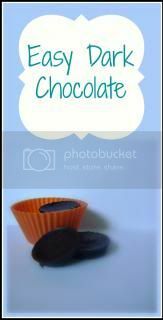 The book is full of great recipes and one of my first attempts was the Skinny Chocolate recipe. While it was pretty good it was too oily for my taste. So I set out to create something that still had the benefits of all that healthy coconut oil but wasn't so oily tasting. First I tried something I found on another website - with twice as much chocolate as oil but it was way too bitter! I settled on equal parts coconut oil and cocoa powder and that tastes perfect to me! (My husband, on the other hand, thinks it's a little too bitter - he prefers milk chocolate. If you do too, I think you could add a tablespoon or two of heavy cream to give a lighter taste to the bitterness of the chocolate. One other note - the flavor does mellow out a bit after a day in the fridge.) Keep this chocolate refrigerated because it softens fairly quickly at room temperature. coconut oil, cocoa powder, xylitol, and powdered stevia extract. Scoop out about a 1/2 cup of coconut oil into a glass measuring cup and microwave for about 30-45 seconds until it's pretty much melted. While that's melting, put 1/4 cup of xylitol into a coffee grinder and grind it up until it's the consistency of powdered sugar. Give it a second to rest before taking the cover off or you'll find yourself in a cloud of white xylitol (ask me how I know!). Then, add the xylitol to the coconut oil. And, if you like things a bit sweeter, add a scoop or two of stevia. Left: coconut oil and xylitol before stirring. 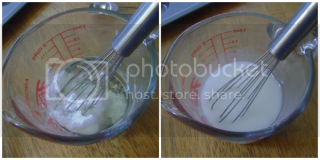 Right: coconut oil and xylitol after stirring. 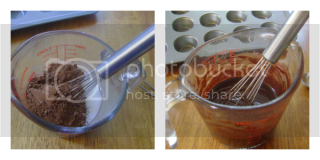 After those are mixed well, add 1/2 cup cocoa powder and stir until everything is dissolved. Give it a lick and see how it tastes. Too bitter? Add a bit more xylitol. Now, at this point, you have a few options. You could pour it out onto a waxed paper covered pie plate and chill in the fridge or freezer until it sets. 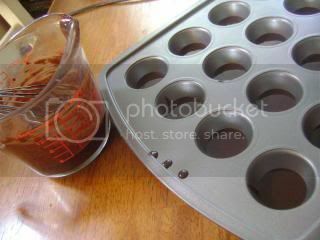 You could pour it out into a mini muffin pan - about a tablespoon of chocolate per little hole is about right. I like to do that for portion control! Or, if you're missing that Magic Shell stuff you can buy and pour on top of your ice cream - this works like that too! Just pour it into a jar and keep in the fridge. Reheat until it's pourable and pour over your ice cream. It will harden when it touches the frozen ice cream and you'll have a healthy dose of chocolate! 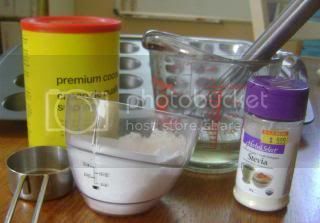 For this batch, I decided to pour it out into the mini muffin pan. No greasing necessary - these pop right out once they are cold. Then I just keep them in a container in the fridge (in the back of the fridge - another one of those portion control techniques!). Don't worry about those little drips... I swiped it off and licked it clean! Melt coconut oil in a 2-cup glass measuring cup. While it's melting, run xylitol through a coffee grinder until it's the consistency of powdered sugar. Add xylitol to the coconut oil along with the stevia and stir until it's all dissolved. Add cocoa and whisk again. Taste for desired sweetness. Pour into molds or waxed-paper-lined pie plate and refrigerate or freeze until hardened. Note: Keep refrigerated as it softens quickly at room temperature. Optional: Pour into a small jar and keep in the refrigerator. When a chocolate sauce or magic shell is needed, reheat and use.